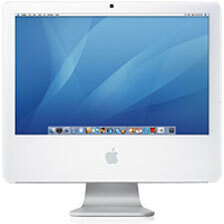 Apple is justifiably famous for its industrial design, and in thecurrent assortment of Apple products, the iMac is widely regardedas a great example of what makes Apple computers special. While my20" G5 iMac is nowtwo generations out-of-date, it's identical to the latest 20" versionin terms of appearance and industrial design. It also really annoys me. Don't get me wrong I still think that the current iMac design isabout the best desktop computer available for home use. Intel or G5makes very little difference to me; they're all very powerful,elegant, and reliable computers that really don't have anyshortcomings in typical use. So what makes them annoying? It certainly isn't the form-factor, which is absolutebrilliance. Apple engineers managed to pack a powerful computerinto an enclosure barely larger than an LCD monitor, and theydidn't skimp on either the display or the computer. The 20" LCD isbright, vibrant, and beautiful, while behind it are mounted a fastprocessor, fast video, fast hard drive, fast SuperDrive, and a pairof good-sounding speakers. What could possibly be annoying about that? Okay, I'll tell you: It's white. There, I said it. While the white casing looks cool, modern, hip, luxurious,clean, and any other superlative you care to use, it's alsodistracting. Last night I sat and watched a DVD movie on it andfound that my eye kept getting pulled away from the movie andtoward the white bezel that surrounds the monitor. I think that this is the reason why most monitors have blackenclosures, as do most laptops. Even the aluminum bezel on my oldPowerBooks was darker than the vibrant white of the iMac - or maybeit's just that there is so much white on the large 20" model(I can imagine the sea of whiteness on the 24"). I did a little comparison at the office this morning and put aDVD movie into my two-headed Power Mac. While both 19" Samsung LCDsare electronically identical, one (the cheaper one) has a simplerblack plastic case, while the fancier one has a titanium-look casemuch the same shade of silver/gray as an aluminum PowerBook. Iwatched a scene on the black monitor, then moved it to the silverone, and then back and forth a few more times. Unscientific as my test may have been, I found that image seemedlarger on the black monitor than on the silver one, even thoughboth are calibrated the same. Is the white case enough to sour me on the iMac experience? No,I still consider it to be the best home computer ever conceived.DVD movies are still impressive on this 20" widescreen bedroomtheater system. But were Apple to release a black iMac, I just might find itincentive enough to upgrade to both an Intel processor and the 24"size.